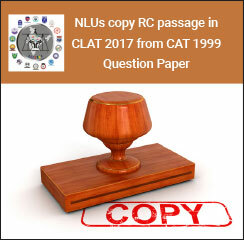 In what may invite more controversy surrounding CLAT 2017, the officially announced question paper suggests that National Law Universities (NLUs) lifted a Reading Comprehension (RC) passage from the Common Admission Test (CAT) held in 1999 for CLAT question paper 2017 along with the same questions as well as answer options. Experts, after examining CLAT 2017 question papers, confirmed about the copied RC from CAT 1999 question paper. “The RC passage and its tail questions are exactly the same as it was in CAT 1999 official question paper. The question numbers, however, have been changed but the questions and their answer options remain exactly the same,” remarks Rajneesh Singh, renowned CLAT mentor. Find below the screen-shots of the CAT 1999 Question Paper and CLAT 2017 Question Paper with same RC passage. As the RC passage was lifted from a CAT paper which is held for admissions to Postgraduate Management level courses, experts suggest that the same being copied for CLAT paper may also be an injustice, given the higher difficulty level of CAT paper, to the examinees aspiring for undergraduate programmes. “While attempting CLAT 2017 Reading Comprehension question, I felt that it was somewhat tough and I had to go through it thrice to understand the crux,” shares Harshit, a CLAT 2017 taker. Clarifying on the ensuing controversy over CLAT question paper, CLAT convenor, Dr A Lakshminath said that CNLU Patna was only responsible for smooth and fair conduct of the exam on behalf of all participating NLUs. He added that “It was an expert committee which set the question paper and no one particular NLU can be held responsible for that.” He however added that all such concerns are being noted by CLAT committee which will take appropriate action very soon. After CNLU Patna published CLAT answer key on May 16, 2017, several test takers and experts raised their doubt on the question paper and answer options. Read here what happened. Last year also CLAT was embroiled in controversies on similar grounds where 135 out of 150 questions were allegedly copied from various public domain sources. CLAT committee had also admitted to several copied questions from different CLAT preparation-related websites. Read here to know more.